The MIDAS partnership comprises 32 organisations from across Europe, including research institutes, universities, specialist SMEs and industry partners. This partnership brings together a wealth of scientific expertise in deep-sea biology, ecology, biochemistry, oceanography, geology and geochemistry to work alongside specialists in marine policy, environmental regulation and legislation. A critical component of the partnership is the expertise in deep-sea exploitation operations and technologies brought by our industry partners, who will also drive the engagement with other commercial stakeholders in the offshore sector. To work with policy makers in the European and international arenas to enshrine best practice in international and national regulations and overarching legal frameworks. To achieve these objectives, the MIDAS work programme covers a very broad range of disciplines (ecosystem studies, ecotoxicology, geological and geotechnical studies, geochemical analyses, stakeholder engagement, socio-economics, legal and policy related aspects), across a wide geographic area including the NE Atlantic, eastern Pacific, the Arctic Ocean, the Mediterranean Sea and the Black Sea (see our research areas below). 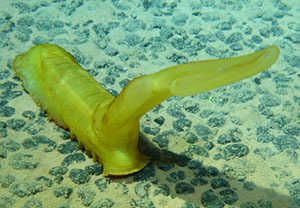 Work packages 1-3 deal with identifying the nature and scale of the expected impacts arising from deep-sea mining; these will inform work packages 4 to 6, which address how these physical changes will affect ecosystems. 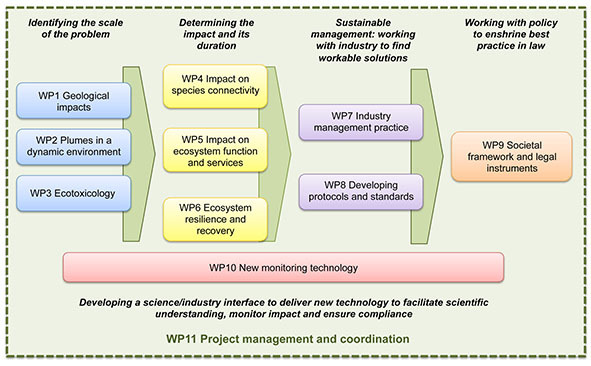 Results from WPs 1-6 will inform and guide the development of industry practices, standards and protocols, and all work streams will feed into WP9, which aims to look at how scientific recommendations can be best supported by a legislative framework. The research carried out in MIDAS will take us to a variety of study sites in the NE Atlantic, eastern Pacific, the Arctic Ocean, the Mediterranean Sea and the Black Sea (see map below). An ambitious cruise programme will call on Europe's ocean-going research vessel fleet and make use of the most advanced marine technology available, including remotely-operated vehicles, autonomous underwater vehicles, cutting-edge monitoring systems, imaging technology and sensors. To find out more about the scientific topics addressed in MIDAS, please visit our Science pages. As the project progresses, results emerging from the individual work pakcages will be posted on this site. This project has received funding from the European Union’s Seventh Framework Programme for research, technological development and demonstration under Grant Agreement no. 603418. MIDAS is coordinated by Seascape Consultants Ltd.